There’s so much to organise when you’re looking to get married. Initially, your dress will be the number one task, as it’s going to be centre stage on your big day. However, the day itself also needs organising – and that’s where the overwhelm tends to kick in. If you’re looking to ease that overwhelm and get a clear plan in place, here are our top seven tips for organising your wedding. All event organisation takes longer than you think, and weddings are no different. Some brides have been planning their wedding for years, from the theme to the food, so have a good idea of what they need to organise. Many brides, however, have no idea on what they want. It doesn’t matter what camp you’re in; it’s going to take time to organise – so get planning! It’s easy to get carried away with the wedding preparation, losing sight of how much your spending – until you’re faced with paying for it all. If you know what your overall budget is in advance, it will help you narrow down your choice of venue, catering, transport etc. If you do get your heart set on something you can’t afford, there’s always the option of seeing if you can up your budget or cut costs elsewhere, to make it a feasible option for you. The venue is your top priority. Many wedding venues get booked months (and even years!) in advance. Shortlist your preferred locations and go scout them out. 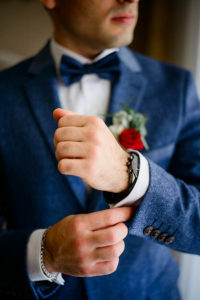 Once you’re there, ask as many questions as you need to make an informed decision – although to be honest, many couples just ‘know’ if a venue’s right, within minutes of arriving. Catering, florist, transport and photographer. They’re all essentials at a wedding and this also means they tend to get booked up well in advance too! Other than your venue, catering is going to be your second biggest expense, so it’s crucial that you get this sorted early, as it will impact on the financial decisions of your other essentials. The florist, transport and photographer are key parts of your wedding, but they can also be adapted to suit your remaining budget. There is so much to organise when planning a wedding. Many brides-to-be take on the organisation themselves, often leaving themselves open to stress and overwhelm. It’s a big task to take on, so get in some help. That help doesn’t have to be a professional planner – it could be your family, the groom and his family, or a couple of trusted friends. The number of guests you invite to your wedding has an impact on several other elements of your wedding plan, including the venue and catering requirements. It’s, therefore, a good idea to get a rough idea of numbers early in the planning stage. You can then send out your invites early, to give your guest plenty of warning to keep the day free. You’re going to be centre stage on your wedding day, so plan how you want to look and ensure you give yourself time to make any changes. Many brides (and grooms!) look to lose weight, get a tan or change their hairstyle and/or colour for their big day. But these things take time to implement and get right. So, don’t add to the stress of your wedding, by trying to do it all at the last minute – factor in the time to make these changes. Finally, allow yourself time to enjoy the process. You’re getting married soon, so take the time to relax, have a bit of fun and enjoy the journey ahead of you! Book your wedding here at Grim’s Dyke and, not only will you get a stunning venue for your exclusive use, you’ll also have a wedding coordinator on hand, to help you plan your big day. We understand that planning your wedding can be stressful, so we have packages to help cover more than just your venue requirements. Why not head on over to our website and check out the different options?